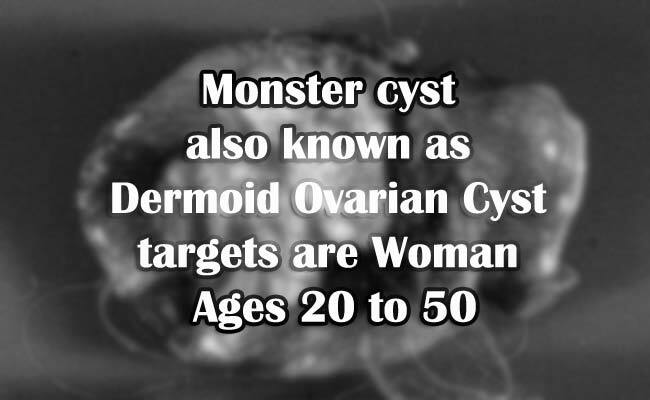 A monster cyst or also known as Dermoid Ovarian Cyst, had been discovered in an unsuspecting young woman in Sta. Maria, Bulacan. The cyst had been known to develop undifferentiated cells responsible in developing hair, sebum, teeth, skin, and sometimes thyroid tissues of its own. Michelle Tolentino’s case had been shared in a special report by ABS-CBN’s Bandila. The 25 year old laboratory analyst had no idea that she had a cyst as big as a closed fist residing in her ovary. Tolentino shared that she only learned of her medical condition when she had a medical check up required by her company for her job. She had been wondering why her red blood cells are always elevated in her urinalysis, prompting her to consult a urologist. However, when she had her ultrasound, the technician asked if she could also do an ultrasound in her pelvic as there are some abnormalities seen. It was confirmed that she has an ovarian mass. According to Dr. Judy Ann Uy-De Luna, an OB-Gyne, monster cyst could consist of bone cartilages, hair, teeth and sebum. It could start from conception as a fetus and could developed until post menstrual age. It might not be detected until later in life, but it could be diagnosed in productive years. Women ages 20 to 50 years old could have this cyst detected in them. Unfortunately, there is no way to prevent the monster cyst, as it won’t be easily detected. Monster cyst could weigh as heavy as seven kilograms ad could be as big as 25 cm in diameters. Though it is usually benign, women with ages 40 and older have 30 percent chance that the cyst could be malignant. In Tolentino’s case, her cyst must be removed as soon as possible. Surgery is the only way to take care of such cases. If untreated, the other ovary might also be affected.